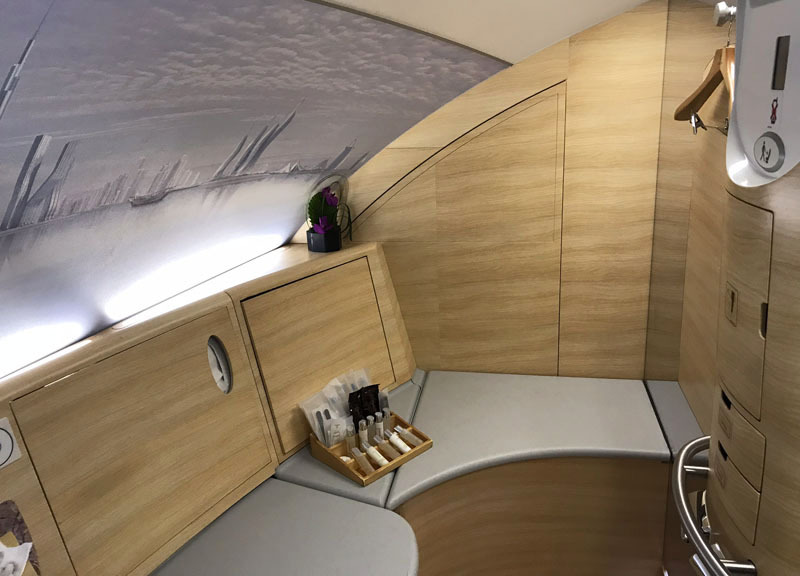 Emirates is one of only a handful of airlines to bring first class to Australia, and on the carrier’s flagship A380 that means enjoying one of the world’s most luxurious ways to fly. Emirates is a popular airline in Australia due to its extensive network and partnership with Qantas. It flies not only from Australian capitals to Dubai and beyond, but also direct from Melbourne, Sydney and Brisbane to Bangkok or Singapore, and from Sydney to Christchurch – with most flights operated by A380s. 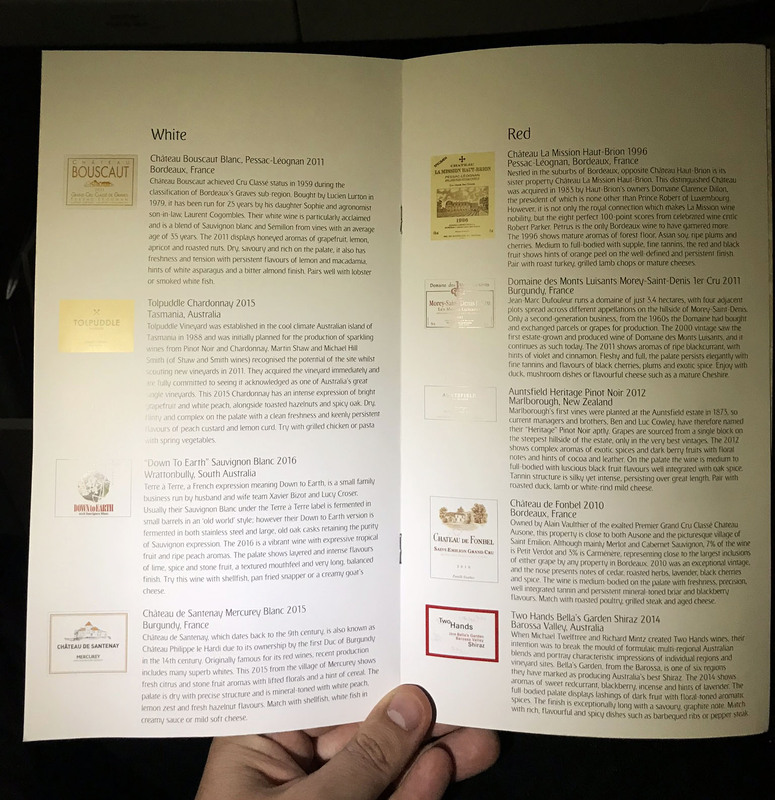 Thanks to Emirates’ partnership with Qantas, Qantas Frequent Flyers can use their points to book seats with Emirates, including in first class – and I think this is one of the best uses of Qantas Points. 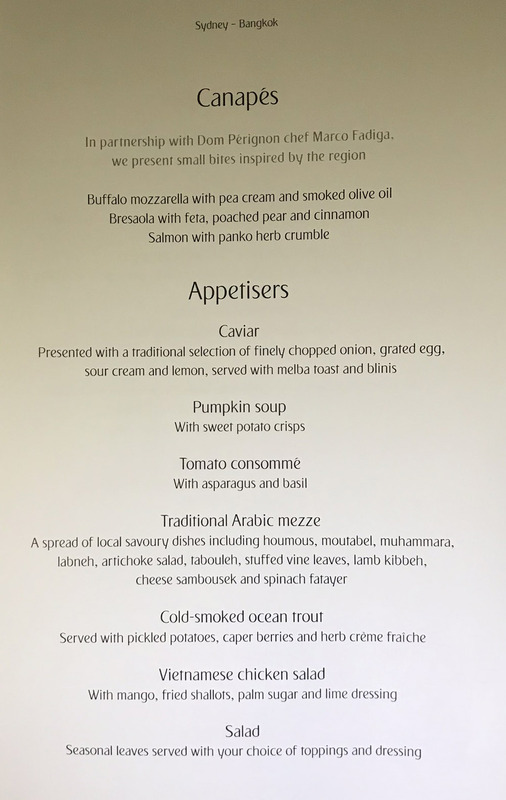 My partner and I recently flew from Sydney to Bangkok in Emirates A380 first class, which costs 90,000 Qantas Points plus $333 in taxes and fees per person: a very reasonable amount for a 9-hour flight! I loved the experience. Here are the highlights. 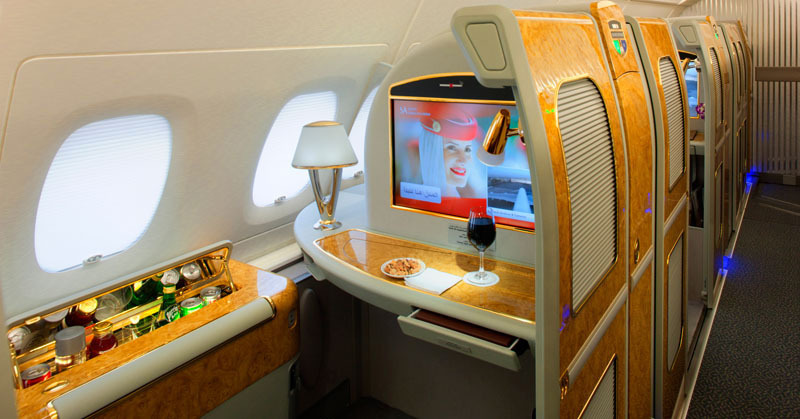 Emirates first class passengers, including those on award tickets (except on flights to New Zealand), get complimentary chauffeur transport to the airport. 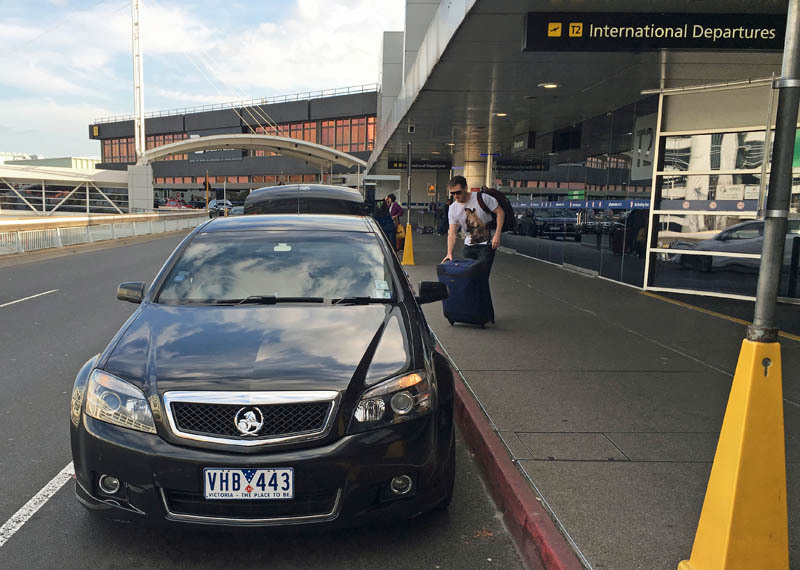 We didn’t need it on this occasion as we were connecting from a domestic Qantas flight, but I have used it in the past and it’s a very comfortable way to start a trip! At Sydney airport, we had a fast-track through customs and immigration, and before I knew it we were relaxing in a lounge – but not the Emirates lounge, which in Sydney is a bit bland compared to the Qantas first class lounge that Emirates first class passengers can also access (always research your lounge options before getting to the airport!). 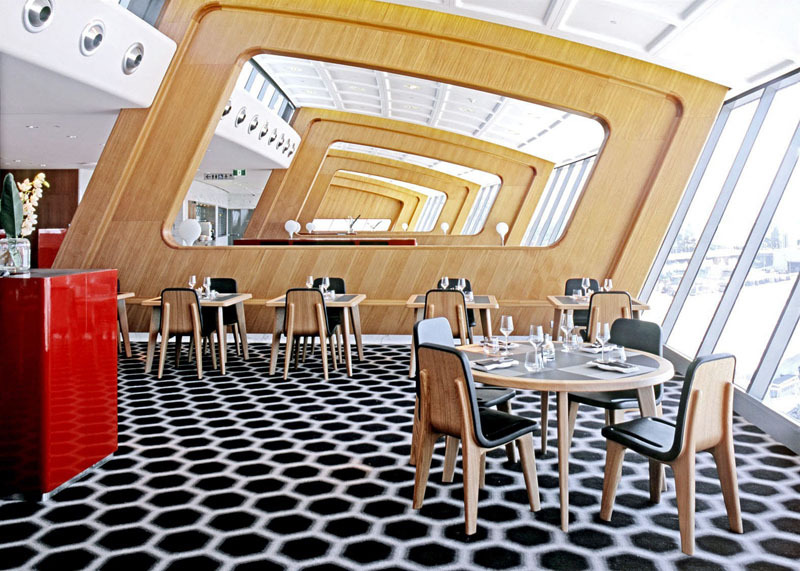 In the Qantas first class lounge you can enjoy a la carte dining, top-notch wine and fabulous views across the tarmac. We soon boarded the A380 via a dedicated business and first class lane, and were escorted to our seats by two of the first class cabin crew. 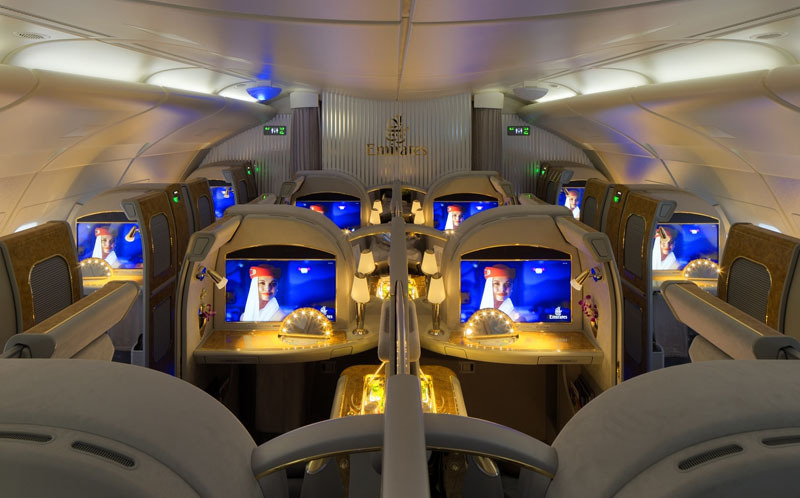 The cabin is exactly what you’d expect from Emirates: out-of-control bling! It’s a visual onslaught of faux wood finishes, gold trimmings, LED lights, lamps, mirrors and flowers. It’s so over-the-top I actually kind of love it! The cabin is located at the front of the upper deck, with 14 first class ‘suites’ in total (which makes for a relatively big first class cabin). There are also two first class bathrooms with showers (more on that later) and a small self-service bar. 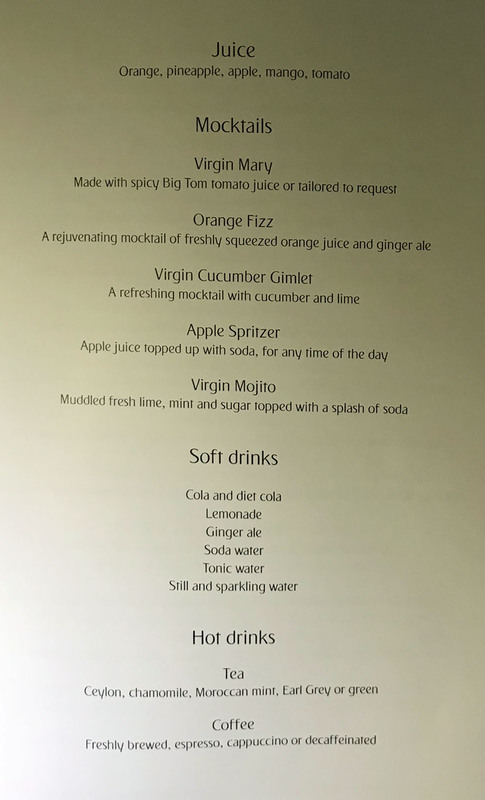 Upon sitting down we were offered a welcome drink, but the champagne was not the Dom Perignon that Emirates usually serves in first class, rather the Moet & Chandon NV from business class – which I declined. 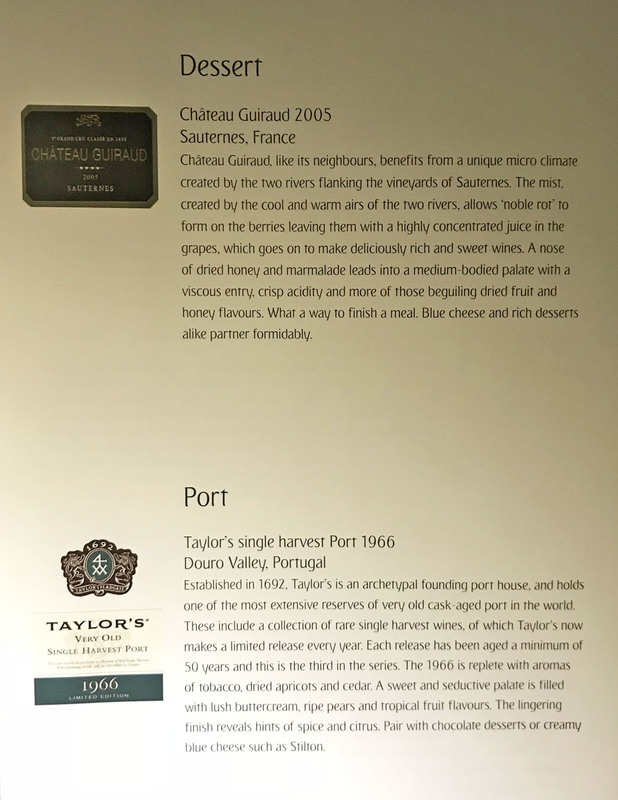 Emirates tends to serve the Dom Perignon after take-off in jurisdictions where alcohol taxes and duties are high, in order to avoid them. That means you have to endure a short, but annoying, delay, before you can enjoy the best bubbles. 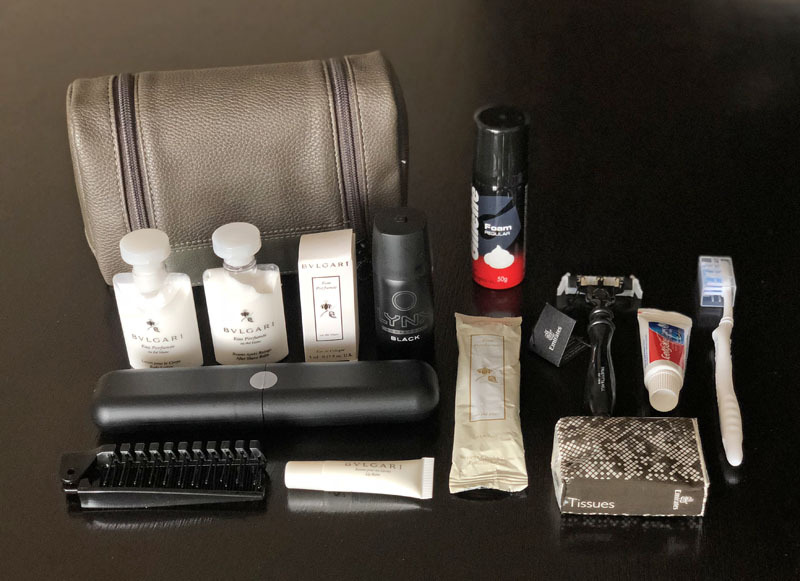 We were also offered Arabic coffee and dates, hot towels, newspapers and magazines, a stylish Bulgari men’s amenity kit, and ‘moisturising’ sleepwear for later use (which apparently “gently releases naturally moisturising sea kelp, so your skin stays soft”). There are 14 seats arranged in a 1-2-1 layout, and with so many potential passengers it helps that there are sliding “doors” that can turn your seat into a more private ‘suite’, as well as a divider that can be lowered or raised if you’re in one of the middle two seats. 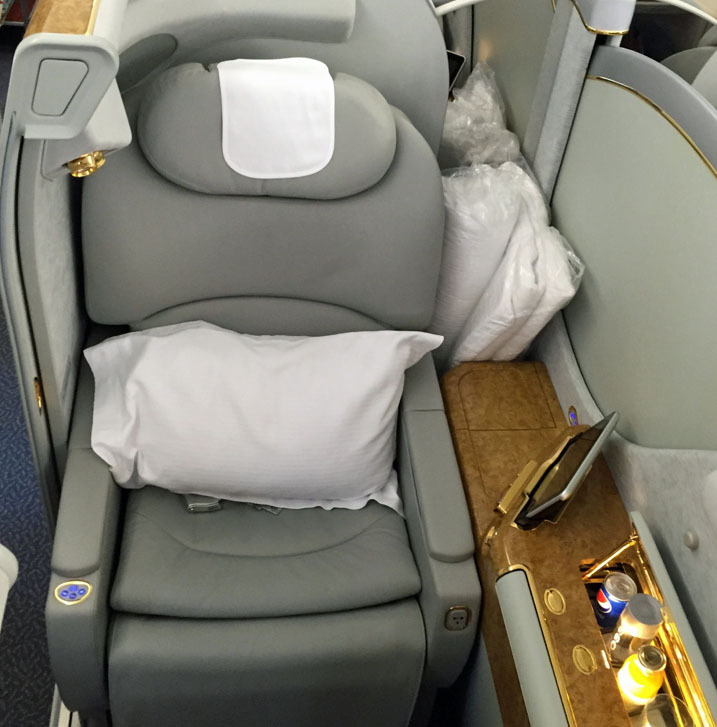 And here are the middle two seats, which are great for couples (photo supplied by Emirates – that’s not us, obviously!). I found the well-padded leather seats to be very comfortable, including for sleep, where the crew affix an extra layer of padding. The seats convert to fully flat beds stretching 2.08 metres in length. 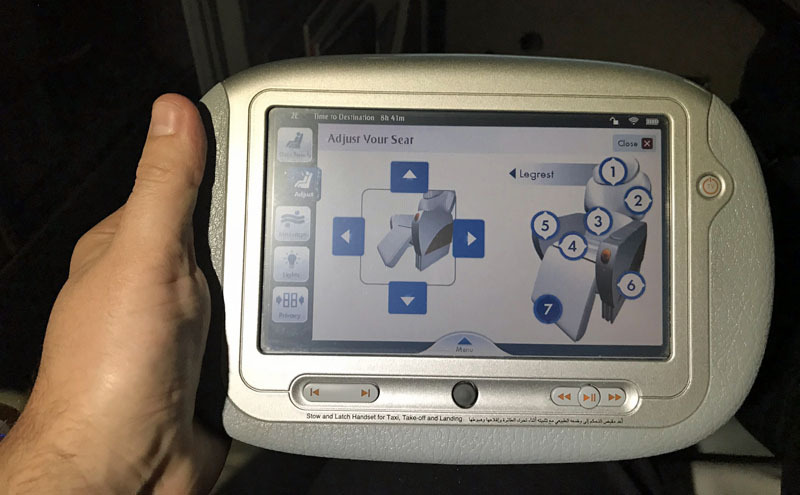 The seat has several pre-set recline settings as well as variable controls, and also sports multiple massage functions. Everything is controlled via a wireless touch-pad, and there’s A LOT to play with – though I found the touch-pad a bit temperamental and complicated to use. There are no overhead bins in the cabin, instead your bag must be stored near your feet – which makes it hard to reach during flight. Fortunately there are lots of nooks within easy reach where you can store personal items. 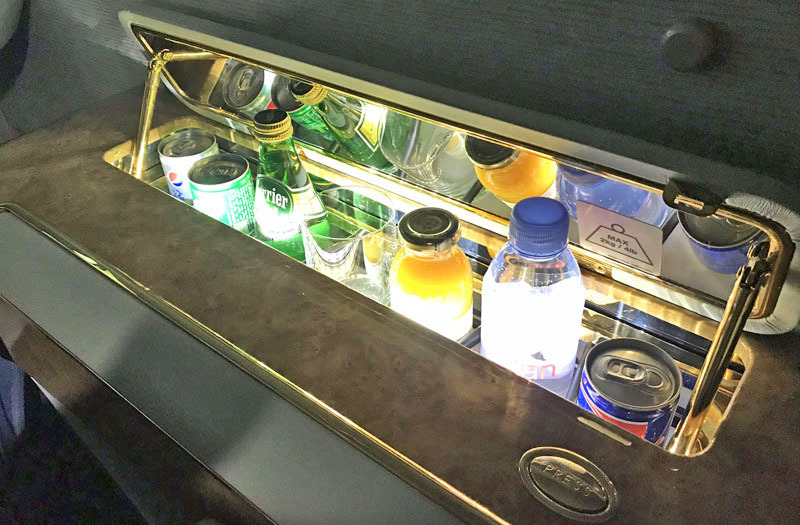 There’s also a built in mini-bar, though it’s a bit gimmicky as the drinks aren’t chilled. There are reading lights, USB ports and AC power in your seat, and you also get noise-cancelling headphones. 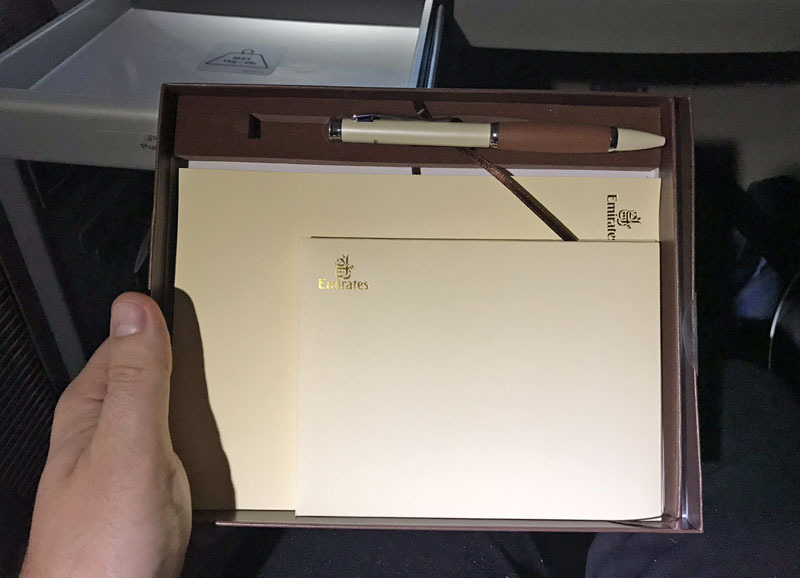 And if all the technology gets a bit much, you can write some first class-inspired letters to friends or family with the writing kit also located in your suite. The menu is on-demand and you can eat at your own pace. 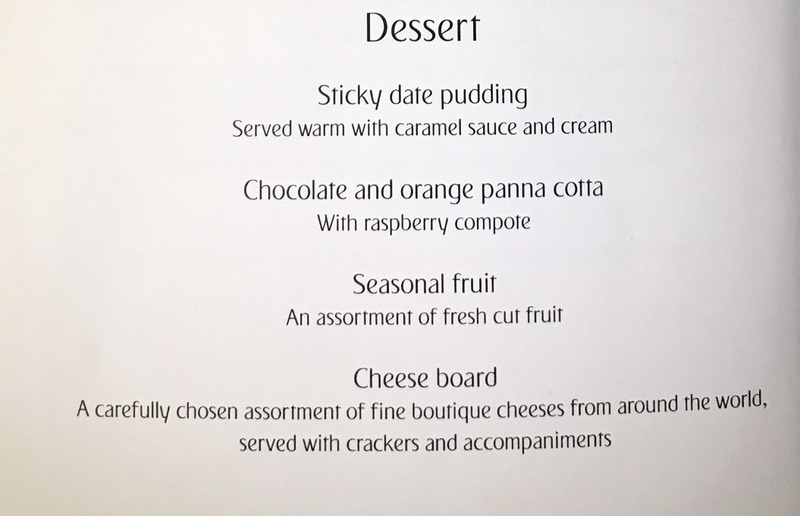 We could choose from a wide range of canapes and appetisers, mains, desserts and cheese, and light bites. 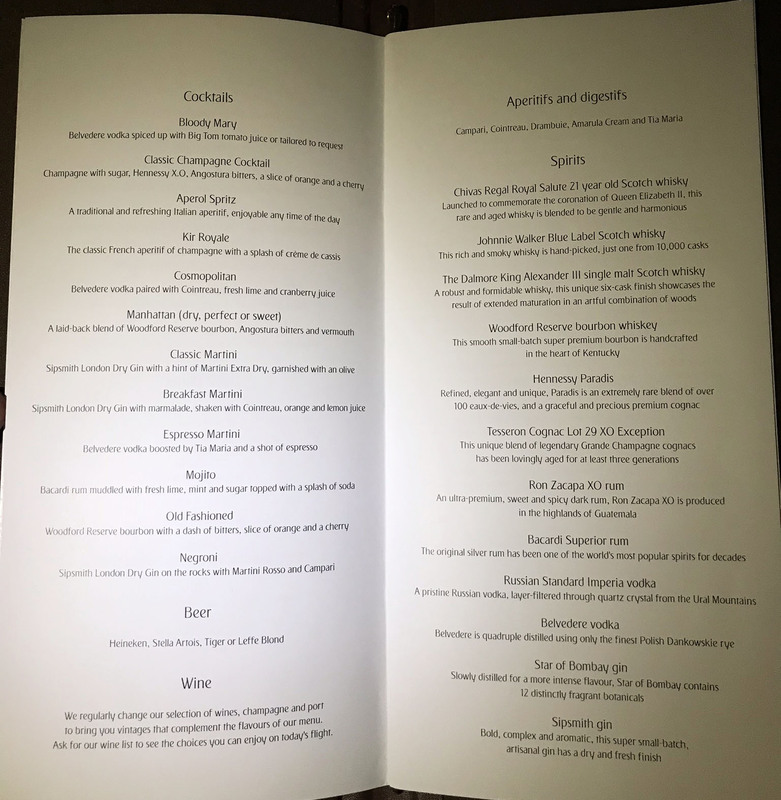 The drinks list included the Dom Perignon (2009 vintage); a selection of wines from Australia, France and New Zealand; cocktails, beers and spirits; dessert wine and port; and non-alcoholic beverages. … and then moving on to the delicious Arabic mezze. The food was wonderful, but we finished there in order to get a few hours’ sleep before landing in Bangkok. 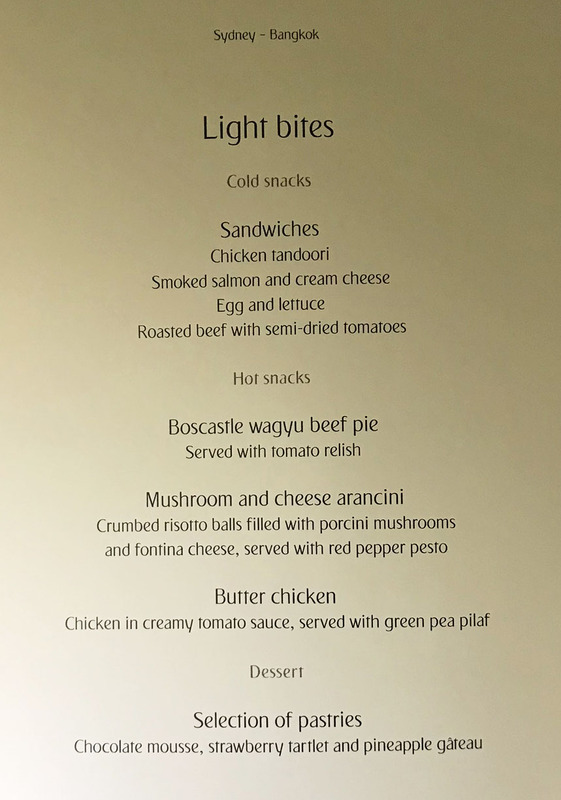 On a daytime flight I would definitely have sampled a lot more of the cuisine! 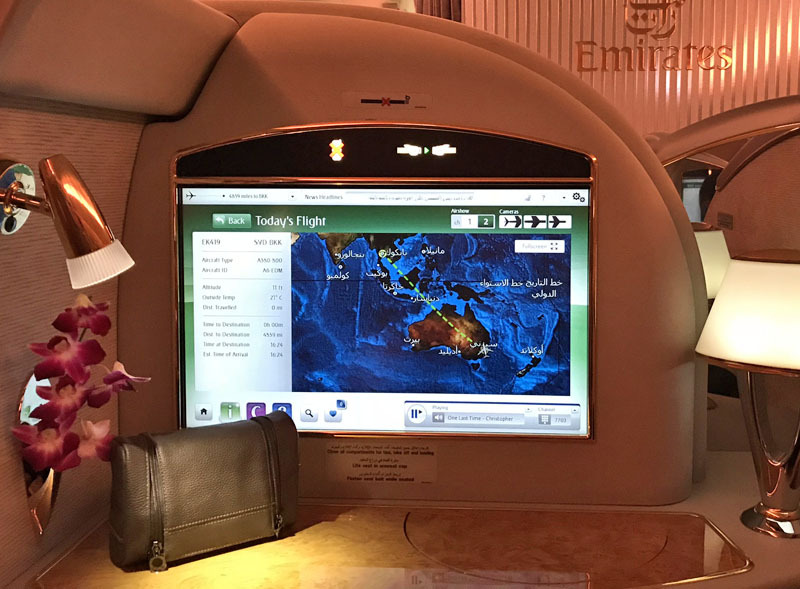 Emirates is known for its extensive and diverse in-flight entertainment, and as usual there was a huge selection of films, TV shows, music, radio and games to choose from – all of which can be enjoyed on a large LCD screen (27-32 inches depending on the aircraft). 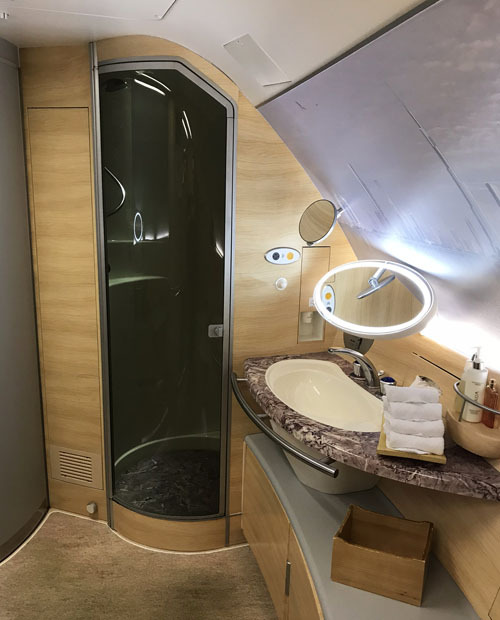 One of the ‘must dos’ when flying Emirates A380 first class is the ‘shower spa’. It’s something only Emirates and gulf rival Etihad offer, and only in first class. You get access to more than just a shower cubicle: it’s part of a surprisingly spacious bathroom that has lots of amenities, heated floors, and a dedicated crew member who sets it up and cleans it after each use. I found taking a shower while flying through the air super fun and refreshing! Another ‘must do’ is the bar and lounge, which is available to both business and first class passengers, and is located at the very back of the upper deck. 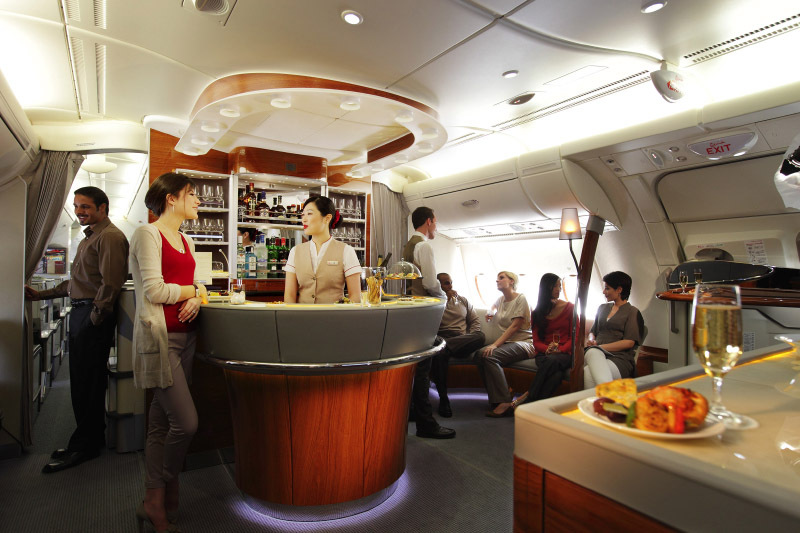 If sipping cocktails at a bar at 40,000 feet is your kind of thing, you’ll love this! My only complaint about the flight was that internet access wasn’t complimentary. It’s free for Emirates Skywards members, but not if you have another frequent flyer program attached to your booking (e.g. if you used Qantas Points to book, like I did), in which case all you get is a measly 20MB of free access, which lasts about five seconds. Otherwise, internet access costs US$9.99 for 150MB or US$15.99 for 500MB. I really think it should be complimentary for all first class passengers. Finally, and to end on a positive note: I have to say that the customer service from the first class cabin crew was superb. They were very friendly and attentive, and really made us feel welcomed and looked after. You’d expect that in first class, but still, I appreciated it. 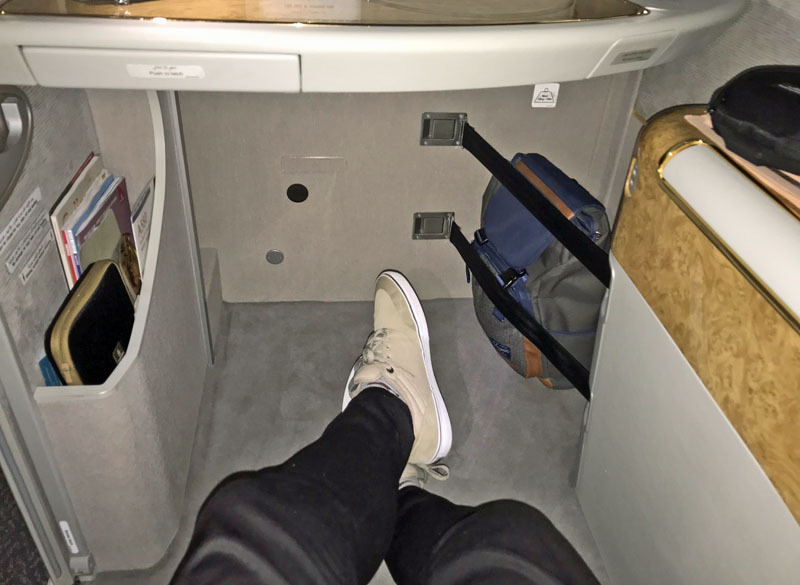 I really enjoyed the experience of flying first class in an Emirates A380. 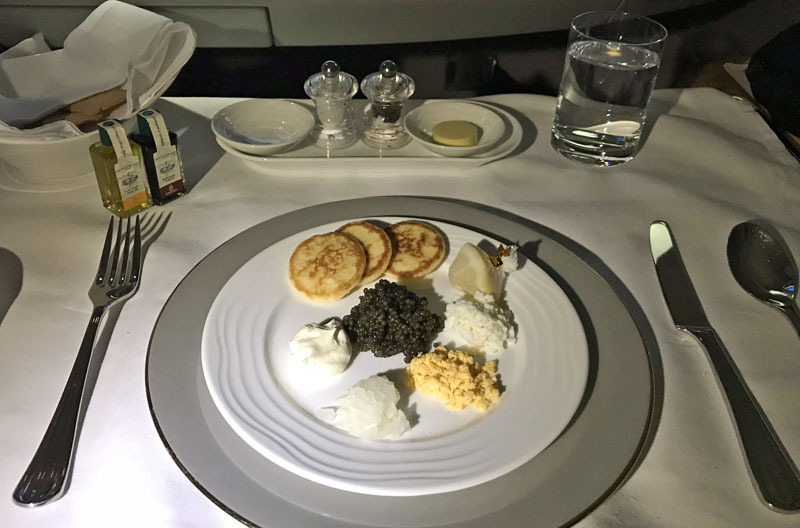 It was so memorable – from the physical space to the dining and service – and I can’t wait to do it again, especially on a daytime flight where I can sample more of the food and drinks. 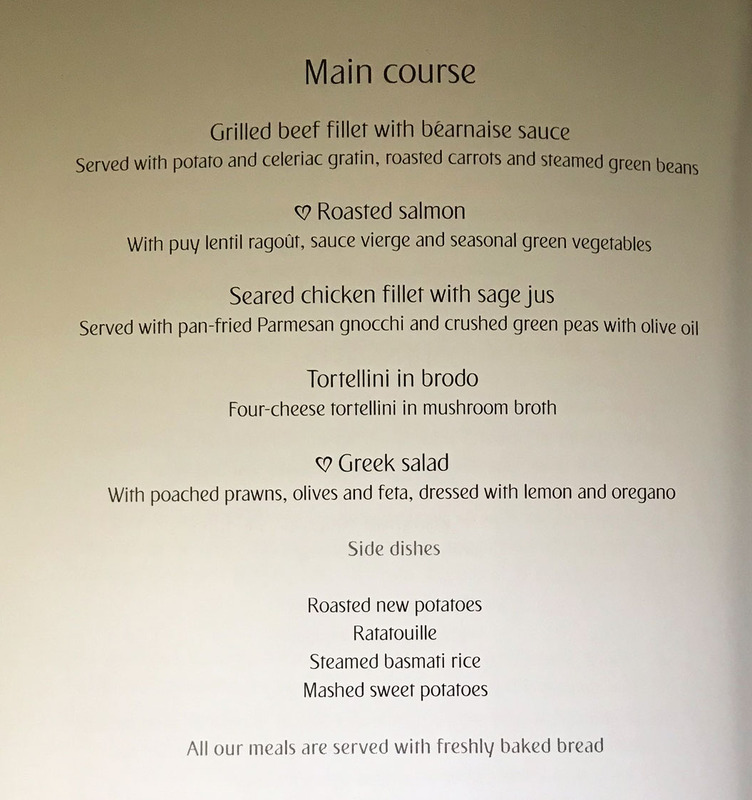 I would definitely recommend using Qantas Points to fly Emirates first class. 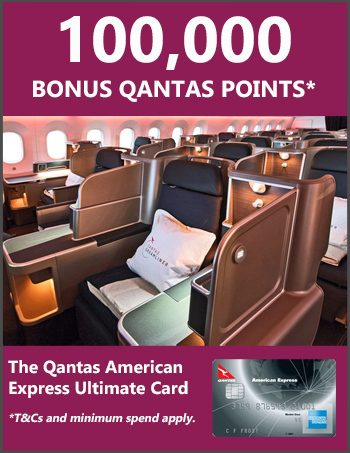 Our flight cost 90,000 Qantas Points plus $333 in taxes per person, which I think is a great deal (you can get 90,000 points right now with just one credit card sign-up bonus). 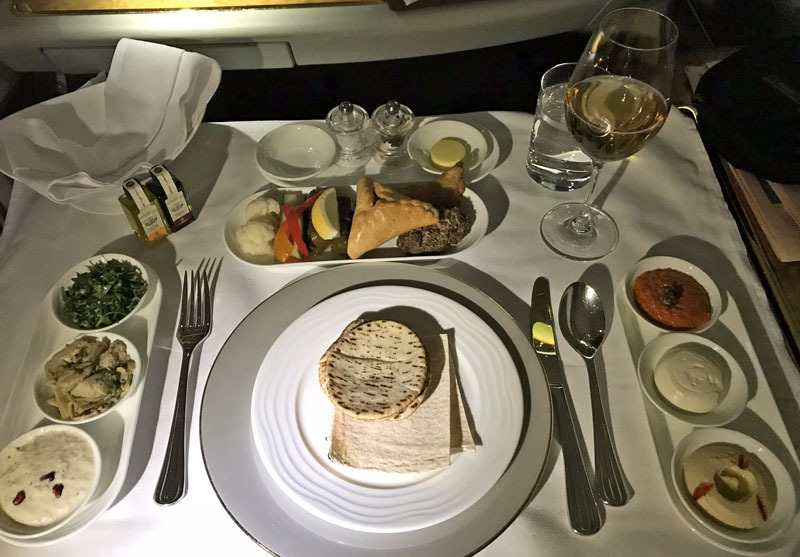 Emirates award seat availability is usually quite good, and if flying first class is a ‘bucket list’ item for you, this is a fantastic way to achieve it. Hi Kris, thanks for the review. We are flying Syd-Bkk-Dub next year first class using points. We have reserved row 1 (the 2 middle seats). Is there a bar in front of us that may disturb us, would we be better in row 2? Or do the showers or toilets interrupt the cabin? Cant wait to experience the flight. Hi Sharee, I’d suggest Row 2 just to be safe. There is a small self-service ‘bar’ and two bathrooms at the front. Enjoy! Emirates First is not my favorite first class product by any stretch of the woods. I have never been in such a contrived fake experience in my entire travel life. As lovely as the staff all were, it felt like i was part of some staged theatrical drama. Beside this, all the bling is just too much. If you love to ‘pretend’ to be rich and love showing off, then this product would be for you. If you want a private, sophisticated and classy experience with out all the epic drama, I suggest you look elsewhere such as Qantas, American, British Airways, Japan Airlines, or Cathay Pacific…. i have experienced all those airlines in their F cabins and they are far superior. Great review mate! 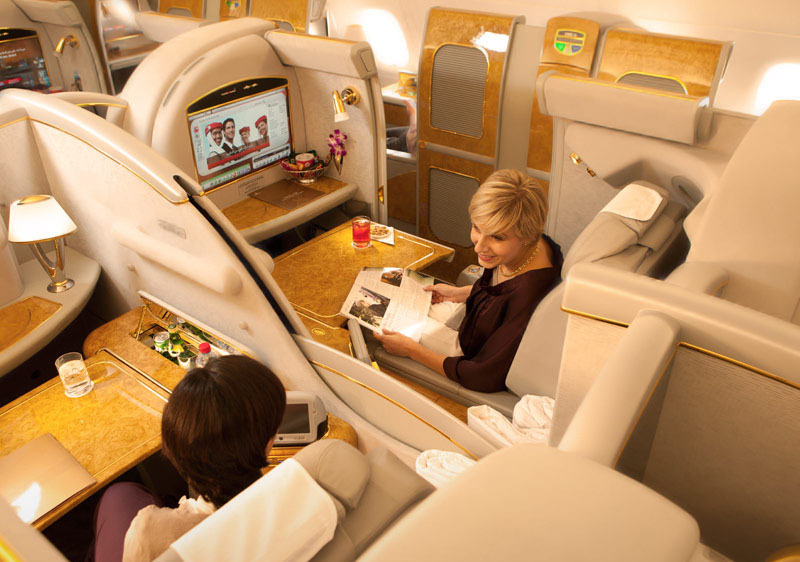 I have MEL DXB CAI DXB HKG MEL all in First class in October this year and can not wait! Huge bucket list item for me! Wow, you’ll have a LOT of champagne to drink 🙂 Enjoy! Nice review.. i’ll be doing excatly the same route syd-bkk in August.. did you use the chaeffuer pick up in bkk? If so how was it? It’s a 2AM pick up right? Yes it was super easy at BKK, you just proceed to the Emirates chauffeur pick up zone. I think it was near Exit 5 (there are signs at the baggage carousel). Enjoy the flight!